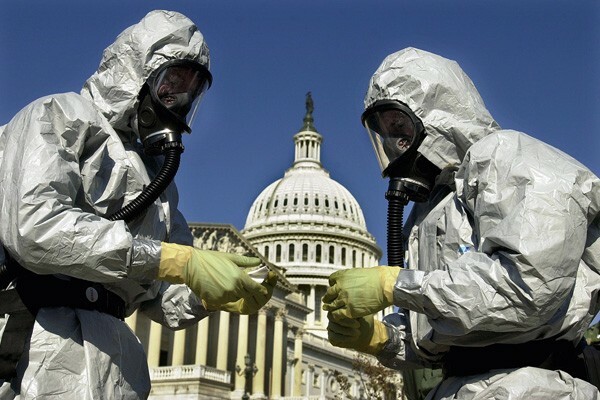 Bioterrorism Attacks, Are You Ready for World War B? The Canadian philosopher Marshall McLuhan coined the term “Global Village.” In his work he explained how the world has been contracted into a village thanks to advanced technology and communications. In his book, McLuhan discusses the cultural implications of the modern world. He used James Joyce´s book, Finnegans Wake, as a model to explain war throughout history. The last type of war is described by McLuhan as a turbulent, muddy wake; a murk of non-visual and tactile. In other words, a war that will use a weapon so powerful than nobody would detect it immediately, such as a biological agent. Recently, researchers from Northeastern University in Boston performed an experiment in which smallpox was hypothetically released in major cities of the world, such as London, New York and Paris, and they measured how prepared those nations were for the bioterrorist attack. They also took into account how fast travelers from afar would spread the disease. The findings were surprising. “Deliberate smallpox released is likely to assume an international dimension even before the epidemic is identified,” they said. The Center for Disease Control and prevention explains that a bioterrorism attack is the deliberate release of viruses, bacteria, or other germs to cause illness or death. Sometimes some of those biological agents can be made more harmful by increasing their ability to resist medical treatment. However, first world nations, thinking about the threat of bioterrorism attacks, have worked on biodefense, which uses medical measures to protect people against bioterrorism, such as medicines and vaccines. The Federal Emergency Management Agency, FEMA, is a program designed by U.S. Department of Homeland Security. FEMA has created an emergency guide, called, Are you ready? The plan is designed to get individuals, families and communities prepared for a major occurrence. The guide gives people a step-by-step approach to disaster; for example, it instructs how to identify hazards that affect entire communities, as well as maintain an emergency communications plan in a disaster supplies kit. The plan, Are you ready? provides in-depth information for the public about some of the worst hazards and threats against humanity, such as bioterrorism, explosions, chemical, nuclear and radiological hazards, among others. The guide explains, that biological agents can be spread through aerosols, animals, food and water contamination, and person-to-person. Moreover, other nations have prepared themselves also. For example, Weapons and Mass Destruction Commission is an initiative by the Swedish Government on a proposal from the United Nations. Its task is to prepare for, reduce and prevent the dangers of weapons of mass destruction, like biological weapons. The most threatening diseases and agents for public health, according with CDC, are: anthrax, botulism, plague, smallpox, tularemia and viral hemorrhagic fevers. They are easily disseminated or transmitted and could result in a high mortality rate, cause public panic and require special action for public health preparedness. The computer and health sciences professor, Alessandro Vespignani, from Boston University, explained to The Atlantic magazine that, “Western cities, with their protocols and vaccines, are pretty well prepared to handle bioterrorism attacks.” However, “the problem is that most of those studies don´t consider the global dimensions of the event. Before you even realize there is an outbreak, it might already be in other places. That changes the game,” he says. In our times, bioterrorist attacks aren´t just part of a fiction movie; they are possible. The medical community and people around the world should be instructed about epidemiology and control measures. Vespignani explains that some countries don´t have the infrastructure of the Western world. In those countries, potent pandemics could destroy entire cities. According to the computer model published by Scientific Reports, the dispersion of the disease could spread quickly around the globe. If that is the case, then, at some point, it might be necessary for all nations to create an emergency guide counterbioterrorism, like the one mentioned above, Are you ready?